Taste test: A classic corn chip brought to Australia. 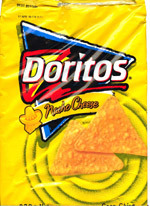 I don't think you can really beat the Dorito Nacho Cheese for the right combination of flavor and chip. The cheesy, tangy flavor is thickly coated, but not in a way that detracts from your enjoyment. The chips are always crisp and perfect. No other Nacho Cheese flavor can compete! Smell test: A cheesy, tangy aroma.